Nintendo Shoots down criticisms of New Super Mario Bros 2 with new trailer! Remember how everyone was going on about how samey New Super Mario Bros 2 looks and how it seems the game isn’t doing anything too different from the DS and Wii installments? Well even though the announcement of Gold Mario and the footage showing this new gimmick showed some new ideas, Nintendo has gone even further with their latest trailer and shown exactly how new the game really is. For instance, it looks like there’s an all new graphics style in at least one level in the game, black and white Castle Bleck style versions of the Super Mario Bros 3 tileset! It’s a visually striking and overall quite interesting new graphics style I must say, and it’s the first time bar those scenes at the end of SMB 3 levels that Nintendo have ever done the monochrome white outlines with black coloured objects thing in a mainstream game! A very visually striking New Super Mario Bros 2 level, or what Castle Bleck would look like in shades of blue rather than black. There’s also one… well not bad thing, but annoying element returning as well. You know those falling volcanic rocks/meteors from New Super Mario Bros 8-8 and New Super Mario Bros Wii 8-1? Those return, and are in the same level as the appearing/disappearing block pathways. Did I mention they can destroy the appearing blocks and make your life a misery? Nintendo looks to be going all out in world 8’s difficulty this time! This is going to be the next generation’s equivalent to Tubular or world 8’s Airship level in SMB 3. The one people talk about dying fifty million times on. There’s also what looks to be either a special world level or bonus area with rainbow coloured platforms and a crystal clear sky with a rainbow going through it. It’s nothing particularly ‘new’ to the series, but it does look nice enough and is a definite visual departure from the rest of the bonus worlds in the series. Above: I do have to say this looks really quite nice. There’s also what seems to be a lot more spikes and mines to avoid in this game, with the trailer showing Mini Mario desperately trying to dodge them while running across a lake filled with Cheep Cheeps, as well as avoiding some spiky columns in the sky. It’s probably nothing special, but it reminds me a little of Yoshi’s Island and the thorns that’d knock out Yoshi/kill him instantly on contact. In addition to the above, we also get our first glimpse at a ghost house from New Super Mario Bros 2. 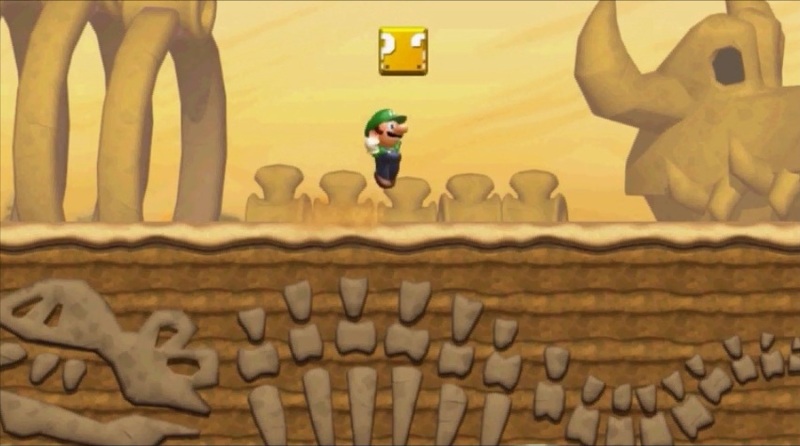 Looks like you’ll be able to turn Boos and Big Boos into gold via switches and the Gold Mario power up, and that those spider webs from the forest levels will also be ghost house obstacles as well. Wonder if the Big Boo boss fight from Super Mario World will show up? I mean, we’ve already got the Koopalings and Reznor, might as well complete the set! Think this’ll return? Think we’ll be able to throw objects upwards again? This is hardly the most similar two first levels in history, is it? The former has far more detail and far more of a Super Mario Bros 3/World feel to it while the DS one went for a style sort of remniscient of Super Mario 64. They look nothing alike bar the general similar ‘layout’/castle placement. And the cave is the same. New Super Mario Bros 2 looks a lot more like the Wii game, except the background seems a lot more faded in the 3DS title than either of its predecessors. Right is the background, left is NSMB DS, bottom left is the 3DS title. The background is completely different, as is the foreground tileset. It’s not like the Wii game either, since it seems the Wii one has clearly prominent windows in the distance whereas the 3DS game has none. Again, the 3DS title has nothing similar to the DS one as far as beach graphics go. The clouds are a different style, the hills are a different style, there are more palm trees and decoration and the water is totally different. It looks a bit more like New Super Mario Bros Wii, but the graphics look a lot more faded as if the background elements are further away from the level. Finally, the castles are nothing alike. New Super Mario Bros DS was always a bit of an oddball game here, it had castle graphics that were never seen again in anything else and had a rather different style that’s not shared with either the Wii or 3DS games. New Super Mario Bros 2’s castle looks more like a toned down version of the Wii game’s ones. Hence in conclusion, New Super Mario Bros 2 is a lot more original than people think and the trailer kind of proves it with all the new gimmicks and additions. What do you think of the new elements Nintendo has added like the appearing block paths and semi monochrome SMB 3 like areas?